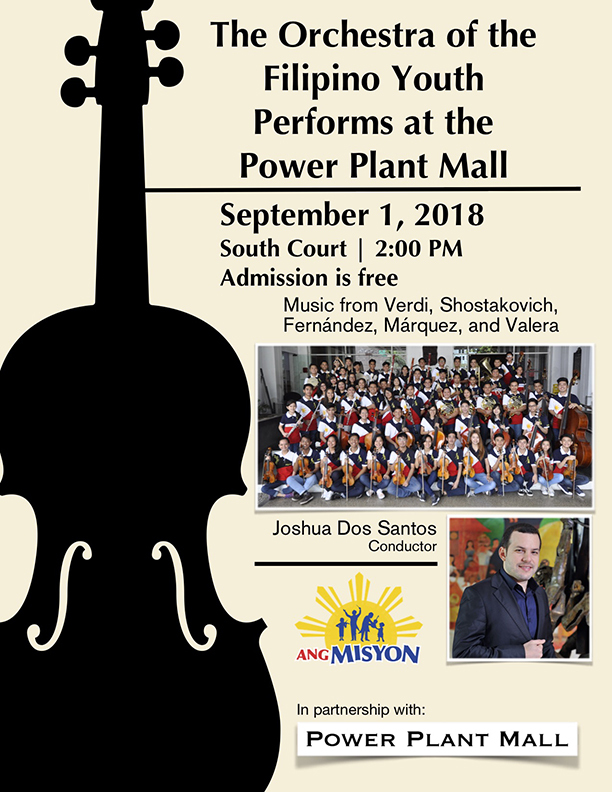 Ang Misyon Brings Their Music to Power Plant Mall – Ang Misyon, Inc.
Power Plant Mall Goers were in for a nice surprise last September 1, 2018 when the Orchestra of the Filipino Youth played a short performance at the Mall’s South Court. The Orchestra played a range of pieces including excerpts from Shotakovich’s Symphony No. 12, to Rey Valera’s Kahit Maputi Na Ang Buhok Ko. They were met warmly by audiences, many of whom were impressed by the talents of the gifted young musicians. Ang Misyon would like to again extend our thanks to Power Plant Mall, a good and generous friend to the Orchestra of the Filipino Youth. Copyright © 2018 Ang Misyon. All Rights Reserved.